While you’re here, check out these 9 images to make you remember 9 advanced English words forever! Have you ever had a problem that you just couldn’t solve for ages? Then suddenly someone says one word, or just shows you one simple picture, and you get that “aha” moment — you suddenly understand everything? Well, over the many, many years I’ve been teaching English, I’ve found that some simple images can help explain rules in English that cause so many problems for people. Hopefully, they’ll help you, too. So here are some of my most effective little pictures to help you remember English rules. In, on or at for place? I’ve actually talked about this in a previous post, but it’s good to see it in a different way. I’m in this really dark room, and I can’t get out. I’ve been on this road for about 8 hours, and I still can’t get off it. I’ll meet you at the station. There are lots of different rules for “the” and “a,” but they all work the same way. It’s all about what the person you’re talking to knows and what she doesn’t know. I saw a giraffe the other day. It was talking to a lion wearing a wonderful hat. The giraffe decided to start eating the lion’s hat. I don’t know why. The small print: there are exceptions to this rule, but even the exceptions follow the same logic. OK. This one can be a little confusing. Please finish this report by 7. Remember that this can be any time before 7 o’clock. I was doing reports until 7. Remember that the action stops at 7 o’clock and not before. “By” is usually used with a simple tense, and “until” is used more with continuous ones. A trip is a big thing, and it might be several journeys. A journey is simply going from A to B. Example? I’ve just got back from a trip to the UK. I travelled by train, car, plane and bus while I was there. I also walked. The trip consisted of about 30 journeys. Yep, we were busy. This is an image that went with a story that one of my students told me. While I was walking down the hill, I stopped at 3 different pubs. The past continuous gives the long background action (walking down the hill). The important (and fun) stuff (going to the pubs) happens inside this past continuous time frame. This is something that I hear advanced English speakers getting wrong all the time! Just remember that we say something, but we tell someone something. “Would” is the future of the past. I didn’t know what he would do next. but they weren’t prepared for that monster! As I mentioned in a previous post, we use the present perfect when the time, effect or action started in the past and is continuing now. It’s kind of easy when the time frame is used. (e.g. Have you seen any giraffes today?) “Today” is clearly not finished. It’s kind of easy when the action is continuing (e.g. I’ve been working here for far too long) because that’s a clear concept — either you work here now or you don’t. But to decide if the effect is continuing or not (e.g. What have you done to her? She looks ridiculous!) is a bit trickier. So imagine an explosive event in the past. Can you still feel the explosion now? If so, use the present perfect. There are -ed adjectives and -ing adjectives (e.g., interesting/interested, boring/bored, infuriating/infuriated). Easy: -ed is the feeling; -ing is the cause. The book is fascinating. I’m fascinated. “Whole” is for one thing. “All” is for many things. He slept through the whole film! He ate all the biscuits. He slept through all of the film. Will or going to for predictions? We usually use “will” when we don’t have any evidence in front of us to make our prediction with. We usually use “going to” when we can see the evidence (like the black cloud in the picture). Go ahead and tell him. He‘ll understand. I can see in your eyes that you’re going to understand everything. OK. I hope you found these useful. If you did, don’t forget to be awesome and share this post. Go on! It’ll make me very happy! Meanwhile, are there any other weird English rules that you find confusing? Let me know in the comments. I love helping! Help me help! ⟵Can You Understand These 22 British English Signs? When you take a daytrip, do you just go somewhere? Or do you go somewhere and then come back again? I love this article! And I would like to use some of these drawings with my students. ? That’s great. Please feel free to use these with your students! That’s fascinating. So it looks like the UK and US Englishes are the opposite when it comes to these words. Buuuut…. I guess a trip to the store works — there’s a journey there and a journey back. I mean, saying “trip” implies you’re coming back, right? Ah. In that case I’d say that in this case, we’re sharing the same meaning with trip, but not with journey — the trip to the shop consists of 2 journeys. Although, to be fair, it would be a bit weird calling them journeys as they’re rather short. Yes, I’m from the NW side of the US, and here journey implies a long and possibly very difficult travel of some sort – often walking or travelling by slower types of transportation such as by horse or camel through mountains, rivers, canyons, etc. “Life is a journey.” You could say, “on my journey home from work,…” but it implies that it was a very long commute. A trip is often shorter distance and/or duration or easier type of travel. Mode of transportation, amount of time travelling, and level of difficulty are the factors involved in choosing trip vs journey. Language and it’s evolution are so interesting! That’s such a nice, and valuable comment. Thanks Hollie. I love the points you make, mostly because they highlight that evolution of language. As teachers, I think it’s really important to point out that different speakers of English may use the language differently. Thanks Olga. Glad you liked it! thanks a lot! I’ll share it with my students now : a good way to revise their English during this hot summer in Italy! I’ve heard it’s crazy-hot at the moment! thanks a lot ! I would like to share such awesome idea with my students . Thanks — I really appreciate it! And yeah — go ahead and share with your students, I’d be glad! Cheers Vladimir. Glad you found them useful! My pleasure. Glad you liked it Mediani! No problem Chandu. Glad you liked it! Cheers Lata. I hope it was useful for you! Thank you! I just discovered I had a couple of these wrong 😉 . That’s great to hear Davide. I’m happy to have helped. We should always be cautious, though. These are a good overview, but, as usual, there will always be exceptions. But I’m glad these helped you get ON the right track! And surely, “I was waiting in the queue forever.” is a nice example of the Present continuous for annoying or weird habits. Thanks Sarah. Just made me happy! That’s so functional. Rules are simple and easy. Would you mind suggesting to improve my fluency in English? There are hundreds of other small things you can do to improve your English. I guess the most important thing is to include a little English in your day-to-day life. Read blogs, keep a diary and watch films and TV. These suggestions are kind of obvious, but that’s the point! It isn’t so much what you do, just how much you do it and how much you keep doing it! New reader here. This is a super useful post, especially for a non native speaker like me. Welcome to the Clark and Miller community! this is an excellent reference for my students and for me. Great! I’m glad it can help! Your ideas are great???. But can You explain why we use e.x. I slept all night long( this is one night so why do not use I slept the whole night)??? The only difference is that it’s slightly stronger. When you say “all night long,” you’re kind of emphasising how long the night was. Charles Prentiss: You were going to spend your redundancy money on a pub. Martin McCabe: No, no, no. I was going to spend my redundancy money IN a pub. LOVE your ideas. They’ll definitely help my students, especially the article a and the. it gives me ideas for a lapbook. My ESL students always put ‘s in every plural nouns they use even though they don’t show possessive. Hope you can help with your drawings. Thanks so much Lin! I really appreciate the positive feedback and I’m glad this was useful for you. The apostrophe s problem definitely needs a pic. I’m working on a book of these, so I’ll think about including it. Thanks! I’ve written a couple of blog posts on the ever-baffling -ing vs. to. 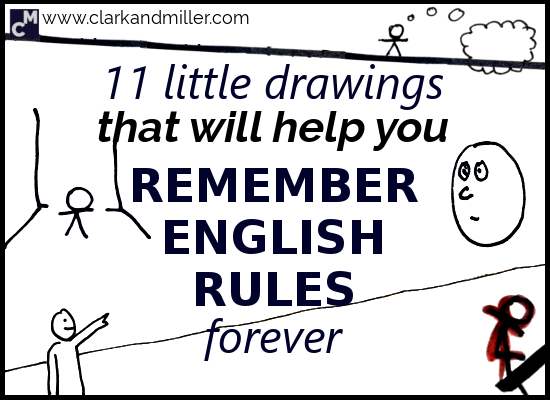 I’m also in the process of writing a book based on this blog post called “101 little drawings to help you remember English rules forever (probably).” It should be out before September. It includes a few gerund/infinitive explanations. Keep an eye out for it on this site. Thanks so much for the positive feedback, Juli! thanks a lot .it is perfet.how clear they are! They are wonderful ideas! I liked them. Thank you, Gabriel, for your work and the big wish to help to all of us! If my English isn’t so good, sorry. But with your help I ‘ll improve it. Your English is awesome, Marina! And thanks for such kind words. I’m really happy I’m helping you with your English development. Thanks a lot for your job! I like your explanations. They help me a lot, when I🙄 find it confusing to explain. Last time was when I had to do mixed conditionals. Some times you feel like a dog: you know everything, understand, but can’t say a word! To find the way to present grammar, to make studens understand is not always easy. Some people say that grammar is not important. It’s true if we learn English, but if we study it, it’s essential! Keep up the good work, Bela! Gabriel, can you explain the difference between “in time” and “on time”? I always get confused with proper using of these expressions. And to be fair, “trip” and “journey” are used differently in different countries. I think Americans look as trips as being quite little things. Like a trip to the shops. Thanks a lot for this job.